If you are looking for a great gift idea for a gamer, then I highly recommend giving the Pizzazz Plus Rotating Oven some consideration. I had never seen or heard of this great counter top kitchen gadget. Then I unwrapped one as a Christmas gift from my mother a couple of years ago, and I have used the hell out of it ever since. This counter top rotating oven is an awesome addition to any kitchen. It is especially beneficial for gamers as the speed of cooking times and ease of use get you back into your favorite game in no time. What Makes The Pizzazz Plus Rotating Oven So Awesome? You can cook a wide variety of items on the Pizzazz Plus. The Pizzazz heats frozen foods in about half the time of a normal oven and it requires no pre-heat time. This is a more energy efficient, less costly option than heating up the stove. And if it is summertime, you can eat frozen foods without having the conventional oven warming up the whole house and raising that air conditioning bill! The nonstick pan is also very easy to clean, even if you have popped pizza roll goo everywhere. The Pizzazz comes with an instruction booklet to set your timer based off on the items being cooked, but it is super simple to operate. You just look up the time required for that item, set the time, and you can walk away and come back to a cooked product which took a lot less energy and time to complete. As I said before, this is a great gift for a gamer, especially a gamer who doesn’t know to cook and relies on frozen convenience foods. That only covers the bare minimum of what this awesome kitchen tool can handle. 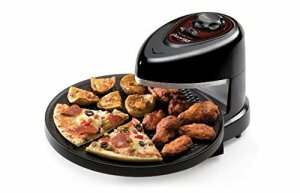 At under $50, the Pizzazz Plus Rotating Oven is perfect for graduation gifts, Christmas gifts, birthday gifts, or just to add to your own household.